The Big Question Behind 'Stonewall' Backlash: Who Threw The First Brick? In reality, no one knows who threw the brick that started the riots; but in a new film, it's a white teenager from Indiana. 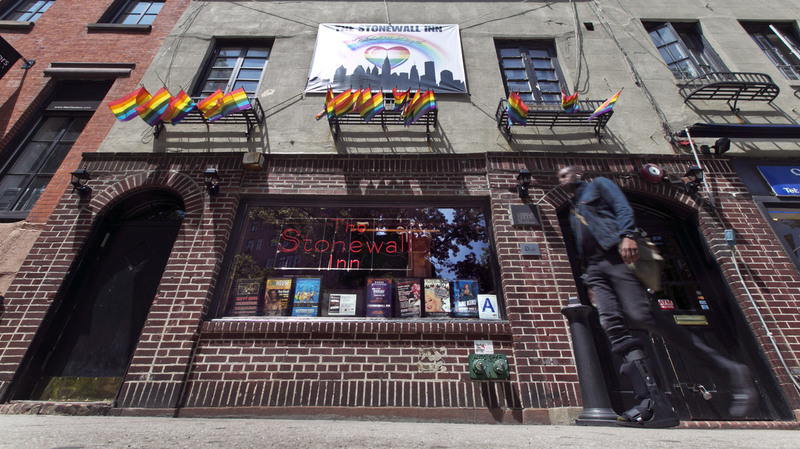 One activist says that "whitewashes" the history of Stonewall. The Big Question Behind 'Stonewall' Backlash: Who Threw The First Brick? In Stonewall, actor Jeremy Irvine (right) plays a fictional high school student from Indiana who throws the brick that starts the Stonewall riots. They're remembered as the sparks for the modern gay-rights movement, but after almost half a century, it's hard to say exactly what happened during the 1969 Stonewall riots. And now Stonewall, a new film interpretation of this history, is fielding backlash even before its Friday opening. Stonewall follows a fictional rioter, Danny, played by Jeremy Irvine. He's a white high school student from Indiana who runs away to New York City after his friends find out that he's gay and his father kicks him out of the house. Once he gets to Greenwich Village, Danny is taken in by a crew of homeless youth, many of them gender-nonconforming and of color. He also meets real-life activist Marsha P. Johnson, a black transgender woman portrayed by Otoja Abit. Danny's new friends show him how to survive on the streets, and eventually — after a love triangle and tangles with the mob — they're all front and center when the riots erupt outside a gay bar called the Stonewall Inn. The movie depicts the riots that actually took place after police raided the Stonewall in the summer of 1969. At the time, New York bars that openly served alcohol to gay customers were often denied liquor licenses and frequently raided. But no one knows for sure why so many bar patrons and onlookers fought back after the June 28 raid, which led to almost a week of rioting. Many of the participants had endured years of raids and beatings before they flung loose change and glass bottles at police outside the burning Stonewall Inn. The film's director, Roland Emmerich, says, "We kind of did this movie mainly to unify and to educate young gays. ... It was not like one group who led this riot — it was everybody." The Stonewall Inn in New York's Greenwich Village is now a national historic landmark and popular tourist destination. Emmerich, who is also known for disaster movies like Independence Day and The Day After Tomorrow, says he wanted a white, male protagonist to serve as a relatable surrogate for the audience. That character, Danny, also throws the brick that starts the riots after he catches his boyfriend cheating on him in the bar. "We knew this didn't happen," Emmerich explains. "This is a fictional story and I think it made ... sense for this story." But it did not make sense for Pat Cordova-Goff, an organizer for transgender youth at the Gay-Straight Alliance Network. After Cordova-Goff saw the trailer, which features the brick-throwing scene, she started an online petition calling for a boycott of the movie, which, she says, "whitewashes" the history of the riots. So far, she's collected more than 24,000 signatures. "Whoever is portrayed to throw the first brick will affect someone's perception of the entire movement," Cordova-Goff says. "You know, it's a statement saying who are we going to, you know, respect and who are we going to portray as the power minds behind this movement?" Tim Stewart-Winter, who studies the history of gay movements at Rutgers University, says it's actually unclear who started the Stonewall riots. "We don't know who threw the first brick just because no one knew at the time that this would be an event of world historical importance," he explains. "It was late at night; it was a murky situation." Still, he says criticism of the new film's interpretation is rooted in divisions within the lesbian, gay, bisexual and transgender community. "White, middle-class people have been the face of gay visibility in Hollywood, in politics for so long that I think people rightly look to Stonewall and say, 'This is something that was not a project of middle-class, white activists,' " he says. A broad coalition of LGBT activists ultimately formed the gay liberation movement that emerged from Stonewall. But Stewart-Winter adds that perhaps the most important driving force against the police during the riots were young street kids and older, self-described drag queens like Stonewall veteran Martin Boyce, who served as a consultant for the new film. Boyce says that despite the criticism, he's proud to be a part of the film and the legacy of Stonewall. "That Stonewall came out of these queens whose lives would have been just bulldozed by history, you know, all of sudden made a difference," Boyce says. "Many of them died thinking they did nothing in their lives. But look at what they did do."